Serve great summer recipes at a BBQ party. 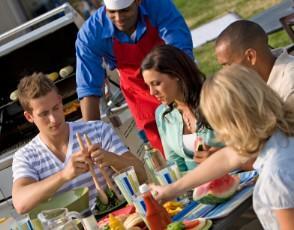 Hosting a casual get-together can be as simple as throwing together some BBQ party ideas. Ideal for summer, BBQ parties are relaxing and easy to plan. While food is important to many parties, it is akin to the guest of honor at a BBQ party. Regardless of whether you use a charcoal or gas grill, you need to have flavorful grilled goodies at your backyard barbeque party. Coming up with your party menu will be one of the first items on your planning checklist. If you do not have time to prepare sides and desserts from scratch, head to your local grocery store. You can usually pick up prepared salads from the deli section of large supermarkets. A hot summer BBQ party requires plenty of drinks to keep guests from dehydration. Have iced water available in multiple pitchers. Lemonade, fruit juice and sweetened iced tea are other non-alcoholic options for a family event. At an adult party, plan to have a few alcoholic options available. A large cooler with beer bottles on ice is a perennial favorite at casual summer gatherings. Mix up pitchers of sangria for a fruity drink. Stock several mixers to make up a few more good party drinks. Western BBQ: Serve Tex-Mex side dishes with a big helping of "yippee-ki-yi-yo!" Hand out cowboy hats to guests as they arrive. Skip the usual lawn chairs in favor of hay bales. String lassos in trees. Wrap tableware in bandanas that will double as napkins. Flamin' Hot BBQ: Pick up party supplies featuring grills and grill flames. Hand out paper fans for everyone to keep cool. Make hot sauce pyramids for table centerpieces. Patriotic BBQ: This is the perfect theme for a 4th of July picnic or Memorial Day party. Place small flags in blue or red pails in the center of picnic tables. Sparklers are the perfect party favor, and stars-and-stripes napkins, paper plates and cups make for easy clean up. Baseball BBQ: Hang baseball caps and pennants of the local team around the backyard. Play a "jock jam" CD or mp3 music mix. Divide everyone into teams for a three or five-inning game of baseball on a small-scale field you set up in some empty space. Set up a sprinkler away from the eating and food area for kids. Let them change into swimsuits and cool off during a hot summer BBQ party. Just remember to mention it in the party invitation wording. Whether you are hosting a family reunion, holiday party or block party, a BBQ is a great way to celebrate the summer. Invite your family and friends for some good food and great company.